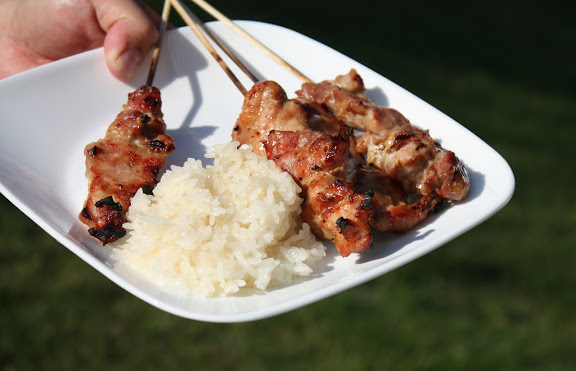 I spent one whole year testing different formulae and cuts of pork for Thai grilled pork on skewers (Mu Ping). Looking back, to be completely honest with myself, I didn’t need that many recipe testings. I just liked the stuff so much I continued to test the same formula after I’d decided it was good enough. Self-deception never tastes so good. Anyway, for some reason, century (also one-thousand-year) eggs have made more and more frequent appearances in my kitchen this year than they previously had. I find their mild, tea-like scent and creaminess such a great canvas for Thai flavors. Besides, I have a special place in my heart for aesthetically-challenged things. 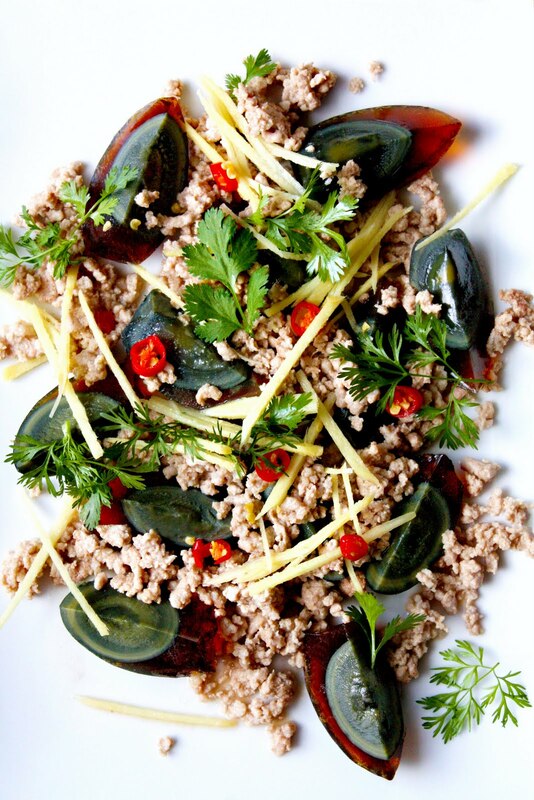 Century egg pad ka-prao — something I never saw growing up — became a hit in the motherland in recent years; it’s also slowly creeping into the menus of more and more Thai restaurants overseas (even those that, when asked what their specialties are, tell you to try their crab rangoons). Try them; they’re friendlier taste-wise than they look. Also known as Sai Krok Isan, this fermented/soured pork sausage is, in my humble opinion, one of the best dishes with which the Northeast of Thailand has ever gifted us. When made well and grilled until the inside is thoroughly cooked and the outside is slightly charred, this sausage tastes so good it makes people wonder why they’ve ever let the word “fermented” scare them away from such a good eat. Thai Northeastern sausage has always been my favorite thing to eat, but the reason I’ve included it on the list of my favorite food things this year is because this is the year I learned to make it myself from scratch without using the commercial fast curing powder (not that there’s anything wrong with it). If you’re interested in the formula which charcuterie expert Bob del Grosso and I came up with, please visit Bob’s blog for the recipe. For those still apprehensive, you can get a taste of this unique sausage at your local Thai restaurant. Unfortunately, only a few places offer this dish and even fewer make it well. Tac Quick Thai in Chicago grills their Isan sausages as opposed to deep-frying, resulting in the smoky fragrance that I associate with better Sai Krok Isan. So far, I have yet to find a better version of this sausage anywhere else in Chicago. If you live in or visit the area, try out the version served at Tac. Jackfruits used to be so hard to find in my area. But things have changed. 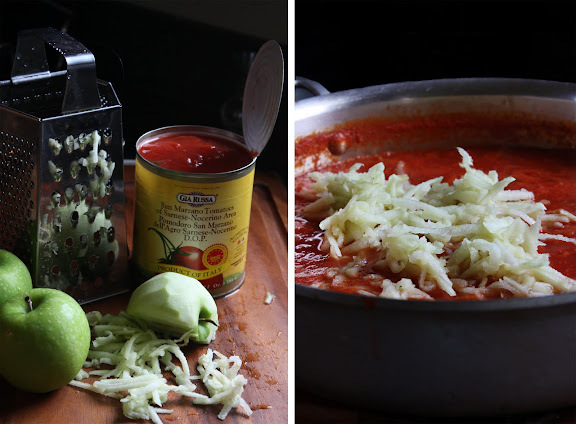 By the time I wrote the post on how to prepare jackfruit, the fruit in its fresh (i.e. neither frozen nor canned) manifestation had made much more frequent appearances at any well-stocked Asian grocery stores where I live. 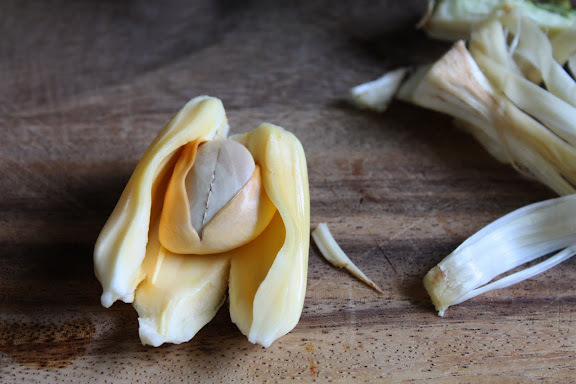 Consumption of jackfruit seeds causes your body to produce the kind of “rough winds” that “shake the darling buds of May” which is a Shakespearean way of saying you should have a bottle of Beano nearby. They’re good, though — these boiled jackfruit seeds. And this year I’ve shaken the darling buds of not only May, but June, July, August, etc. And guess what — more winds are predicted next year. With my mind set on finding out whether the chestnut-like jackfruit seeds can be candied like marrons glacés, there will be many kitchen experiments in the coming months. Hopefully, by the end of 2012, I will have discovered a way to make good candied jackfruit seeds. I will be friendless, but — let the heavens be my witness — I will have been triumphant. I don’t talk about products a lot here on this site, and when I do it’s always only because I like the products and want to recommend them to you. So here’s another recommendation for which I receive absolutely no financial compensation from the proprietor: kaffir lime leaf essential oil. Many of you have a hard time finding fresh kaffir limes and fresh kaffir lime leaves in your area, and I can completely sympathize with you. That has been my struggle also. Fortunately, kaffir lime leaves freeze extremely well, so whenever my favorite grocer has them, I buy a whole bunch and freeze them to use throughout the year. However, as many of you have written, the only thing you can find is dried kaffir lime leaves. I hate dried kaffir lime leaves. I really do. They’re useless as far as I’m concerned. I’d rather make my Tom Yam Kung or Tom Kha Gai with commercial Tom Yam or Tom Kha paste than try to make these dishes from scratch using dried kaffir lime leaves. But now you have another option in the absence of fresh kaffir lime leaves. When added in small amounts towards the end of the cooking time, this concentrated kaffir lime leaf essential oil gives you that familiar fragrance that is so fresh and so natural that it will be as if you had used fresh kaffir lime leaves. This is very useful when it comes to a dish wherein the fragrance of kaffir lime is essential, e.g. panaeng curry, Thai fish cakes, Hor Mok. 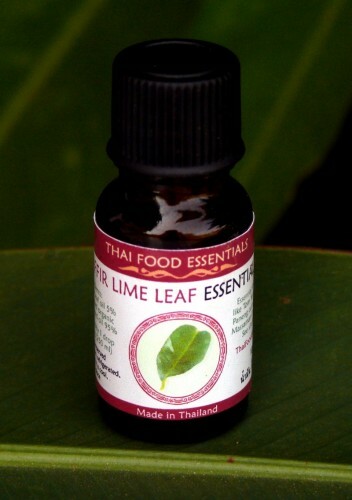 Thai Food Essentials makes some high-quality kaffir lime leaf oils. Check them out. Earlier this year, I made and fell in love with this sauce which, according to Bastianich, is from Trentino-Alto Adige/Südtirol in Northern Italy. You can find the recipe for it in the book Lidia Cooks from the Heart of Italy or online here. This sauce is great on spaghetti. Lots of freshly-grated Parmigiano-Reggiano is a must. That Lime oil looks great. Ordered! If it tests out I won’t buy the tree I was considering. Indoor citrus in pretty hopeless. They always get spider mites and die inside in the winter. “I” Isaan sausage at Tac Quick in Chicago. I completely agree with you. It is fantastic and my good friend Andy is the chef and part owner of the restaurant. TAC Quick is one of the best and most authentic Thai restaurants in Chicago. Thanks for posting. Jeff – I’ve found that, for my taste, I prefer to use more drops than recommended on the website. For example, to make about 2 cups’ worth of Tom Kha Gai, I use about 2-3 drops of the 5% oil; for the same amount of panaeng curry, I use twice as much. Could be a personal thing. I really like the scent of kaffir lime. Also — and thanks for asking this question because I should’ve said all this in the post — I’ve found that it’s best to add the oil to the dish *after* it has been cooked. This is not always possible; you can’t do this with deep-fried dishes such as Tod Man Pla (Thai fish cakes). But when it comes to panaeng curry or infused soups such as Tom Yam or Tom Kha, this works extremely well. I guess heat renders the oil less potent. That is a lot of tasty looking food! Happy New Year! You have a beautiful blog! This post on your 26 favorite food items is very interesting. Great job! My goal this year is to learn how to make pad thai from this blog. Wishing you the very best in 2012! Whoa, that’s a heck of a list, you’ve inspired me to branch out as I’ve been in a culinary rut lately. Thanks for sharing and inspiring. Loved this post! I can’t wait to try the kaffir lime leaf essential oil. I live in Alaska, 90 miles from the nearest Asian market; they do carry lime leaves, but the price has gone up from $3.00/half pound to $6 for 12 leaves! Yikes. So glad to hear there’s an alternative, because my family loves Tom Yum Gai. I just discovered your blog, and I am in love! I live in Atlanta, and have yet to find Kaffir lime leaves, even at some Asian markets… The idea of the essential oil is fantastic. Thanks for all of your hard work and inspiring me to branch out in the kitchen. Happy New Year, Leela. Must make G and I immediately. Guess who got the new 17″ Lodge pan for Christmas. Major daily hint dropping did work this time. Love your list. I have listed all the entries here. Then I’ve asked @DwightTurner, the man behind Eating Thai Food to randomly choose the numbers (he had NO idea what the numbers were for). For Giveaway#1: @brberliner, @sundevilpeg, @JMWeishaar, @abredro, and Anthony Robinson from my Facebook page. Where can I find a recipe for the salad (the yam part?) that goes with yam khai yiao ma? I recently found a store where I can buy these eggs (stoked, been hoping to find them in my country after eating them many times in Thailand), and I want to learn some traditional ways to prepare them. Thanks.